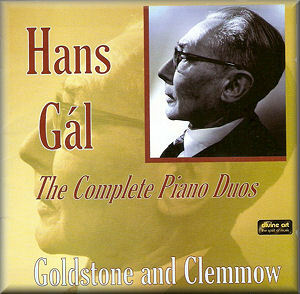 The recent recordings devoted to the music of Hans Gál have been heartening. They’ve ranged from the symphonic to single movement solo piano works, and staging posts in between. That said, it was not wholly a discographic desert a decade or so ago. Back in 2001, the team of Caroline Clemmow and Anthony Goldstone recorded the music for piano duo for Olympia (OCD709). Don’t be confused by its reappearance under licence here. It’s the same thing. It’s very welcome for all that and if you missed it first time around, now is your chance to take advantage of the portfolio of discs by the composer now available. The Three Marionettes Op.74 date from 1958 and offer commedia dell’arte pleasures, whether brimming over with contrapuntal drollery (the first) or mining post-Schumannesque charm in the second. The six Serbian Dances for piano duet are much earlier, having been composed in 1916, shortly before the Dual Monarchy, which bound together the Serbs and all the other denizens of Austro-Hungary, imploded. These dances are well couched in the vernacular, and are certainly versed in the language of those two august predecessor sets of dances by Brahms and Dvorák. They’re eager and melodically generous pieces with especially interesting, often meditative, B sections that offer plenty of internal contrast. They’re played with delicious attention to detail and also a fine sense of flow – not least when conveying wry rubato: try No.3 in F sharp minor, which is delightful. Gál’s harmonic feints, even so early in his compositional life (this set is his Op.3), are also notable. The Concertino for two pianos (1934) is in three baroque-sounding movements. The first is a genial French overture, once again freighted with harmonic interest. The second is a beautifully sustained Siciliano which anticipates a pert fugal finale. The work was originally written for solo piano and string orchestra, but it works well in this guise. In 1940, now in exile, Gál wrote the Three Impromptus for two pianos and they mix engaging, rather roast beef Englishry with playful light-heartedness. The recital ends with the charming 1954 Pastoral Tune, originally written for six hands at one piano – always a fun genre – but here transcribed for the more squeeze-free four hands at two pianos. For the most part this is Gál in unbuttoned mood, and a source of great entertainment and vitality.